Building on the popularity of our X4 AC Plus, we decided to take it up a notch with the introduction of our X4 AC Pro high-performance, microprocessor-controlled charger/discharger with extensive battery management capabilities. Capable of operating on 100 - 240 volts AC household current or from an 11 - 18 volts DC power source, this new multi-faceted powerhouse exudes a total charge circuit power of 200 watts with Power Distribution capability in AC mode and a 300-watt output when in DC mode. 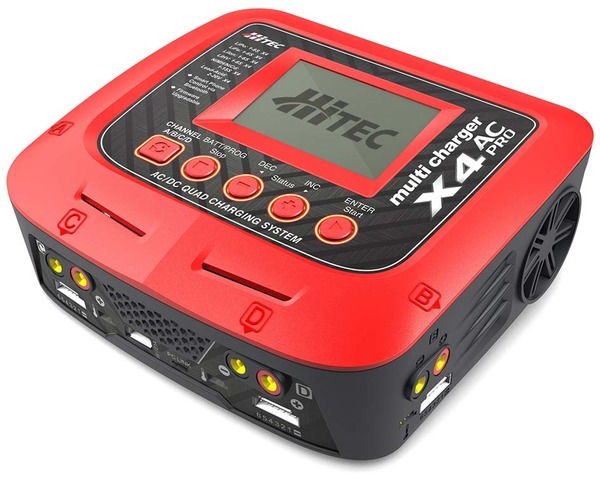 The X4 AC Pro allows you to connect up to four batteries of varying chemistries (NiMh /NiCd/LiPo/LiFe/Lilon/LiHV/Pb) to any of the charging channels with each channel performing independently of one another. Additional features include our Charge Master software, providing the unprecedented ability to operate your charger via your personal computer plus a built-in Bluetooth for Smartphone app operation. Experience the future of charging with Hitec! All warranties and guarantees, including missing items, are handled directly by the manufacturer of that item. Should t here be any problem with a product, you (The Customer) will need to contact the manufacturer to obtain service. Manufacturer contact information is available upon request. We must be contacted for a return authorization number before returning items for any reason. We cannot accept returned items that have been opened or are not in their original sealed factory containers.